A Civilian was killed by Israeli settlers in Qasrah village, southeast of Nablus. A child Succumbed to his wounds he sustained in the 2014 Israeli offensive on the Gaza Strip. 6 civilians, including a child, were wounded in protests in the West Bank and Gaza Strip. Israeli warplanes carried out several air strikes in the Gaza Strip. 2 civilians, including a girl, were wounded, and roofs of houses and greenhouses sustained material damage. Israeli forces continued to apply the collective punishment policy. A house belonging to a prisoner’s family was demolished in Qabatiyah village, southeast of Jenin. Israeli forces conducted 75 incursions into Palestinian communities in the West Bank and 12 similar incursions in Jerusalem. 94 civilians, including 20 children and a woman, were arrested. 25 of them, including 11 children and a woman, were arrested in Jerusalem and its suburbs. They opened fire 10 times at the border area, but no casualties were reported. An under-construction building and a parking in Shu’fat refugee camp, north of occupied Jerusalem, were demolished. 14 shooting incidents targeting the Palestinian fishing boats occurred in the Northern Gaza Strip. 3 Palestinian civilians were arrested at the checkpoints in the West Bank. Israeli violations of international law and international humanitarian law in the oPt continued during the reporting period (29 November – 06 December 2017). During the reporting period, Israeli settlers killed a Palestinian civilian in Qasrah village, southeast of Nablus. Moreover, a child succumbed to his wounds he sustained in the 2014 Israeli offensive on the Gaza Strip. Israeli forces wounded 5 Palestinian civilians in the West Bank while wounded 3 civilians, including a child and a woman, in the Gaza Strip. In the Gaze Strip, the Israeli warplanes carried out several airstrikes at military training sites of the Palestinian armed groups. As a result, Palestinian civilians sustained wounds in addition to material damage in the sites. The Israeli forces also continued to chase Palestinian fishermen in the Sea. In the same context, a civilian sustained a metal bullet wound to the back after Israeli forces moved into Qabatiyah village, southeast of Jenin, to demolish a house belonging to Mohammed Abu al-Rab, who is accused of carrying out a stab attack in Kafer Qasem in Israel on 04 October 2017. On 04 December 2017, 2 Palestinian civilians were wounded when dozens of Israeli settlers gathered at the eastern entrance to Qasrah village, southeast of Nablus, to raid a cave in Ras al-Nakhil Mount. Dozens of Palestinians gathered to prevent the settlers from raiding the cave, so the Israeli forces opened fire at Palestinians. As a result, 2 civilians were wounded. In the Gaza Strip, medical sources in the Gaza European Hospital in Khan Yunis announced on 06 December 2017, the death of Mohammed Abu Haddaf (9) from al-Qararah, northeast of the city. Mohammed’s Family said to PCHR’s fieldworker that on 08 August 2014, Mohammed sustained severe wounds after an Israeli warplane fired a missile at a gathering of civilians in Abu Haddaf neighbourhood in the village. As a result, 9 civilians, most of them were children, were killed and wounded. Mohammed was hit with shrapnel throughout his body and in his bone marrow, causing paralysation to Mohammed. His medical health condition was very bad since he had been wounded until he died. In the same context, the border areas with Israeli witnessed protests against the ongoing and unjust Israeli closured against the Gaza population. During those protests, the Israeli forces used force against the protesters. As a result, a child was wounded, east of Jabalia in the northern Gaza Strip. As part of Israeli air strikes, the Israeli warplanes carried out several airstrikes that targeted several military sites affiliated to Palestinian armed groups. As a result, 2 civilians, including a girl, were wounded and a number of roofs of houses and greenhouses sustained material damage. In the Gaza Strip, as part of targeting fishermen in the sea, PCHR monitored the Israeli naval forces’ escalation against fishermen in the Gaza Sea although it was announced that the Gaza fishermen are allowed to sail to 9 nautical miles instead of 6. This proves that the Israeli forces continue their policy of targeting fishermen in their livelihoods. During the reporting period, Israeli gunboats chased fishing boats and opened fire at them 14 times; 8 of them in the north-western Beit Lahia, 5 of them in the western Sudaniyah area, west of Jabalia in the northern Gaza Strip, and one in the Gaza City Sea. As a result, 5 fishermen, including a child, were arrested but later released while their boat was confiscated. As part of targeting the border area, PCHR monitored the Israeli forces firing 10 shells and opening fire along the border fence between the Gaza Strip and Israel. The Israeli forces carried out one incident in the northern Gaza Strip, 2 incidents in Gaza City, 5 incidents in the central Gaza Strip, and 2 incidents in Khan Yunis. As part of the collective punishment policy applied by the Israeli forces against the Palestinian families of those accused of carrying out attacks against the Israeli forces and/or settlers, early on Friday, 01 December 2017, Israeli forces demolished a house belonging to Mohammed Zeyad Abu al- Rab in Qabatyah, southeast of Jenin. The one-story house established on an area of 140 square meters sheltered 5 individuals, including 3 children. It should be noted that, the Israeli forces accused Mohammed of carrying out a stab attack in Kafer Qasem in Israel on 04 October 2017 and killing an Israeli. During the reporting period, Israeli forces conducted at least 75 military incursions into Palestinian communities in the West Bank while they conducted 15 incursions into Jerusalem and its suburbs. During those incursions, Israeli forces arrested at least 94 Palestinian civilians, including 20 children and a woman, in the West Bank. Twenty four of them, including 11 children and a woman, were arrested in Jerusalem and its suburbs. As part of the house demolitions, on 05 December 2017, Israeli Municipality bulldozers demolished an under-construction building and a parking in Ras Shehadah area in Shu’fat refugee camp, north of occupied Jerusalem, under the pretext of building without a licence. The first floor of the building was supposed to be a garage for engineer ‘Essam Mohammed while the building would have sheltered About 50 persons. The residents of the area said that the Israeli forces intend to demolish 3 residential under-construction buildings in the abovementioned neighbourhood near the annexation wall. On 06 December 2017, Israeli Municipality crews accompanied with the Israeli police moved into Beir Ayoub, Wadi al-Helweh, and al-‘Abasiyah neighborhoods in Silwan village, south of the Jerusalem’s Old City. The municipality crews also fixed demolition order to a number of residential buildings. As part of the Israeli settlers’ attacks against Palestinian civilians and their property, on 30 November 2017, Israeli settlers attacked Asma’a Shoyoukhi (53) and her daughter Raghad (17) when they were in al-al-Sharaf neighborhood in Jerusalem’s Old City. As a result, they sustained bruises. Asma’a said to PCHR’s fieldworker that a number of settlers attacked her and her daughter and beat them with belts and a metal pole and verbally insulted them. The Israeli police arrested the abovementioned civilians on claims of attacking settlers. During their detention in al-Qeshlah police station, Asma’a asked the interrogator to check the surveillance cameras in the scene. After checking the cameras, it showed that Asma’a and her daughter are the ones who were attacked by the settlers. As part of the Israeli settlers’ attacks against Palestinian civilians and their property, on 30 November 2017, a group of Israeli settlers, some of them were armed, moved into Ras al-Nakhil area, east of Qasrah village, southeast of Nablus. One of them opened fire at a civilian, who was working in his land and shot him dead. Following this crime, the village residents detained the settlers in a cave in the area before the Israeli forces intervened and took them out. On 04 December 2017, a number of settlers gathered at the eastern entrance to the village, in response to calls from settlement organizations to be in the cave. Thus, dozens of the village residents gathered to prevent them from entering the cave. A number of Israeli soldiers stepped out of their vehicles and opened fire at the Palestinian civilians. As a result, 2 civilians were wounded and their wounds were classified as serious. On 30 November 2017, a group of settlers from (Pay Tag) groups from “Yitzhar” settlement protected by the Israeli forces attacked the south-eastern outskirts in ‘Asirah al-Qabliyah village, south of Nablus. At approximately 01:00, Israeli forces moved into ‘Asker Old refugee camp, northeast of Nablus. They raided and searched a house belonging to the family of Ahmed ‘Esam Darwish (15) and then arrested him. Around the same time, Israeli forces moved into ‘Asker New refugee camp, northeast of Nablus. They raided and searched 2 houses belonging to Ahmed Rami ‘Ouda (18) and ‘Odai Ahmed Rawash (15) and then arrested them. Around the same time, Israeli forces moved into Harmalah village, east of Bethlehem. They raided and searched a number of houses and then arrested 3 civilians, including 2 brothers, namely Yasin (46) and his brother Ibrahim Salim l-Zair (43) and Hani Khalil al-Zair (44). Around the same time, Israeli forces moved into Tulkarm. They raided and searched 2 houses belonging to Darwish Mustafa Nufal (20) and Mohammed Saleh Khadrawi (20) and then arrested them. At approximately 02:00, Israeli forces moved into al-‘Aroub refugee camp, north of Hebron. They raided and searched several houses after which they arrested 3 civilians namely Ibrahim Mahmoud Jawabrah (19), Sa’ed Theeb Banat (20) and ‘Ammar Jawabrah (19). Around the same time, Israeli forces moved into Barqah village, northwest of Nablus. They raided and searched a house belonging to Talal Khalid Talal Saif (22) and then arrested him. At approximately 02:30, Israeli forces moved into Qarawet Bani Zaid village, northwest of Ramallah. They raided and searched a house belonging to Omer Raja ‘Arar (19) and then arrested him. Around the same time, Israeli forces moved into ‘Arourah village, northwest of Ramallah. They raided and searched a number of houses after which they arrested Omer Mustafa Khasib (21) and Noor Eden Abdul Rahim ‘Arouri (24). At approximately 03:00, Israeli forces moved into Tubas. They raided and searched a number of houses after which they arrested Hilal Hasan Taher Daraghmeh (25) and Hammam Burhan Lafi Daraghmeh (27). Around the same time, Israeli forces moved into Husan village, west of Bethlehem. They raided and searched several houses and then arrested 3 civilians, namely Isamil Hasan Hamamrah (24), Mohammed Fayez al-Debes (23) and Yazan Khalid Shushah (23). At approximately 07:00, Israeli forces moved into al-Khader village, south of Bethlehem. They raided and searched a number of houses and then handed summonses to Mohammed Mahmoud Saleh (13) and Mohammed Sa’oud Nasim (15) to refer to the Israeli Intelligence Service in “Gush Etzion” settlement, south of the city. At approximately 09:15, Israeli gunboats stationed offshore, northwest of Beit Lahia in the northern Gaza Strip, opened fire at Palestinian fishing boats sailing within 3 nautical miles and chased them. As a result, the fishermen were forced to flee fearing for their lives, but neither casualties nor material damage was reported. Note: During the aforementioned day, Israeli forces conducted (5) incursions in the following areas and no arrests were reported: Surif, al-Shoyoukh and Taffuh villages and in Hebron; and Tal village, southwest of Nablus. At approximately 00:30, Israeli forces moved into Bethlehem and stationed in Ma’ali Valley and al-Mawaleh Mount areas in the center of the city. They raided and searched 2 houses belonging to Mohammed Jamal al-Haremi (20) and Salah ‘Emad Jawarish (20) and then arrested them. At approximately 08:00, Israeli forces moved into Tal Ma’ien area, northeast of Yatta, south of Hebron. The soldiers surrounded a number of farmers while they were planting winter seeds. The soldiers ordered the farmers to evacuate their lands, but the farmers refused. The soldiers then arrested 10 farmers, including a child, and transferred them to an unknown destination. The arrestees were identified as ‘Ali Yusuf Hasan Jabrin (59), Mohammed Yusuf Hasan Jabrin (55), Jaser Yusuf Hasan Jabrin (45), Anwar ‘Ali Jabrin (35), Basem ‘Ali Jabrin (30), ‘Emad ‘Ali Yusuf Jabrin (28), Yasser ‘Ali Yusuf Jabrin (15), Amjad Mohammed Jabrin (35), Yusuf Mohammed Jabrin (25) and ‘Ali Mohammed Jabrin (20). At approximately 09:40, Israeli gunboats stationed offshore, northwest of Beit Lahia in the northern Gaza Strip, opened fire at Palestinian fishing boats sailing within 4 nautical miles and chased them. As a result, the fishermen were forced to flee fearing for their lives, but neither casualties nor material damage was reported. At approximately 14:00, Israeli forces stationed along the border fence between the Gaza Strip and Israel, east of al-Sheja’eya neighbourhood, east of Gaza city, opened fire at Palestinian agricultural lands in the area. However, neither casualties nor material damage was reported. At approximately 14:30, Israeli forces stationed along the border fence between the Gaza Strip and Israel, east of al-Zaytoun neighbourhood, east of Gaza city, opened fire at Palestinian agricultural lands in the area. However, neither casualties nor material damage was reported. Ghassan Abdul Mo’ti Abu ‘Ayad (33) was hit with a shrapnel throughout the body. At approximately 17:12, Israeli war planes fired 6 missiles at Muhajer military training site of al-Quds Brigades (the armed wing of Islamic Jihad), west of Rafah in the southern Gaza Strip. As a result, there was a huge damage at the site. Civilian Khalid Kamel Salim Basalah (37), from ‘Ezbet al-Nada in al-Mawasi area near the targeted site, said that one of the missiles blown up in the sky and its shrapnel spread over a number of houses and green houses. As a result, the houses and greenhouses sustained minor damage as the residents panicked. However, no casualties were reported. At approximately 20:30, Israeli war planes fired one missile at an agricultural land in al-Shawkah village, southeast of Rafah in the southern Gaza Strip, but no casualties were reported. Note: During the aforementioned day, Israeli forces conducted (7) incursions in the following areas and no arrests were reported: Beit Ummer, Sa’ir, Surif villages and ‘Aziz Valley area, west of Ethna village in Hebron; Tulkarm refugee camp, east of Tulkarm; and Kafer Thulth village, east of Qalqiliyah. At approximately 06:00, Israeli forces moved into Beit Jala and stationed in al-Sahel Street in the center of the city. They raided and searched a house belonging to Mo’ath Nader Jararish (24). The soldiers then handed a summons to Mo’ath to refer to the Israeli Intelligence Service in “Gush Etzion” settlement complex, south of the city. At approximately 06:30, Israeli forces moved into al-‘Ezzah refugee camp, north of Bethlehem. They raided and searched a house belonging to Mo’ath Abdul Jabbar Abu Tarboush (35) and then handed him a summons to refer to the Israeli Intelligence Service in “Gush Etzion” settlement complex, south of the city. At approximately 06:40, Israeli gunboats stationed off al-Sudaniyah shore, west of Jabalia in the northern Gaza Strip, opened fire at Palestinian fishing boats sailing within 2 nautical miles and chased them. The shooting recurred at approximately 07:35 on the same day. As a result, the fishermen were forced to flee fearing for their lives, but neither casualties nor material damage was reported. At approximately 06:50, Israeli gunboats stationed offshore, west of Gaza city, opened fire at Palestinian fishing boats and chased them. As a result, the fishermen were forced to flee fearing for their lives, but neither casualties nor material damage was reported. At approximately 07:00, Israeli forces moved into ‘Aydah refugee camp, north of Bethlehem. They raided and searched a house belonging to Mohammed Nasser Badawneh (19) and then handed him a summons to refer to the Israeli Intelligence Service in “Gush Etzion” settlement complex, south of the city. At approximately 07:30, Israeli forces moved into Bethlehem and stationed in Hendazah Mount area in the center of the city. They raided and searched a house belonging to Ahmed Hasan Nawawrah (31) and then handed him a summons to refer to the Israeli Intelligence Service in “Gush Etzion” settlement complex, south of the city. At approximately 09:45, Israeli forces stationed in military watchtowers along the border fence between the Gaza Strip and Israel, north of Buret Abu Samrah in the northern Gaza Strip, opened fire at the border area. However, neither casualties nor material damage was reported. At approximately 10:30, Israeli soldiers stationed along the border fence between the Gaza Strip and Israeli, opened fire at Palestinian farmers into the east of al-Maghazi in the central Gaza Strip. As a result, the farmers were forced to leave their work and flee from the area fearing for their lives, but neither casualties nor material damage was reported. At approximately 20:50, Israeli gunboats stationed offshore, northwest of Beit Lahia in the northern Gaza Strip, opened fire at Palestinian fishing boats sailing within 4 nautical miles. They also fired a number of flare bombs in the sky and chased the boats. As a result, the fishermen were forced to flee fearing for their lives, but neither casualties nor material damage was reported. At approximately 02:00, Israeli forces moved into Zabuba village, west of Jenin. They raided and searched a house belonging to Rabe’i Kamel Suleiman (48) and then arrested him. At approximately 16:00, Israeli soldiers stationed along the border fence between the Gaza Strip and Israel, opened fire at Palestinian farmers into the east of al-Maghazi in the central Gaza Strip. As a result, the fishermen were forced to leave their work and flee from the area fearing for their lives, but neither casualties nor material damage was reported. At approximately 18:30, Israeli gunboats stationed offshore, northwest of Beit Lahia in the northern Gaza Strip, opened fire at Palestinian fishing boats sailing within 3 nautical miles and chased them. The shooting recurred at approximately 20:00 on the same day. As a result, the fishermen were forced to flee fearing for their lives, but neither casualties nor material damage was reported. At approximately 21:50, Israeli soldiers stationed along the border fence between the Gaza Strip and Israel, opened fire at Palestinian farmers into the east of Gaza Valley (Johr al-Deek) in the central Gaza Strip. As a result, the fishermen were forced to flee fearing for their lives, but neither casualties nor material damage was reported. Around the same time, Israeli forces stationed along the border fence between the Gaza Strip and Israel, east of Khan Yunis in the southern Gaza Strip, fired a number of flare bombs in the sky of the area, which is adjacent to the abovementioned border fence, east of al-Qararah village. They also sporadically opened fire at the area, but no casualties were reported. At approximately 22:20, Israeli soldiers stationed along the border fence between the Gaza Strip and Israel, fired several flare bombs into the east of Gaza Valley (Johr al-Deek), south east of Gaza city, and no other incidents were reported. Note: During the aforementioned day, Israeli forces conducted (3) incursions in the following areas and no arrests were reported: al-Fawar refugee camp, Beit Ummer and al-Thaheriyah villages in Hebron. At approximately 01:30, Israeli forces moved into Hebron and stationed in Abu Katilah neighbourhood. They raided and searched a house belonging to Mohammed Akram al-Zaghir (17) and then arrested him. At approximately 02:00, Israeli forces moved into ‘Azzoun ‘Etmah village, southeast of Qalqiliyah. They raided and searched 2 houses belonging to Mahdi ‘Ali Fawzi al-Sheikh (22) and Isamil Fa’eq Hasan Ahmed (23) and then arrested them. They also confiscated 2 vehicles. At approximately 02:30, Israeli forces moved into Rantees village, northwest of Ramallah. They raided and searched a house belonging to Mos’ab ‘Ayed al-Khatib (22) and then handed him a summons to refer to the Israeli Intelligence service on Monday, 11 December 2017. Around the same time, Israeli forces moved into Beit Amin village, southeast of Qalqiliyah. They raided and searched a house belonging to Mohammed Rashid Abdullah Omer (27) and then arrested him. At approximately 07:05, Israeli gunboats stationed off al-Sudaniyah shore, west of Jabalia in the northern Gaza Strip, opened fire at Palestinian fishing boats sailing within 4 nautical miles and chased them. As a result, the fishermen were forced to flee fearing for their lives, but neither casualties nor material damage was reported. At approximately 14:50, Israeli soldiers stationed along the border fence between the Gaza Strip and Israel, opened fire at an empty land into the east of al-Maghazi in the central Gaza Strip. However, no casualties were reported. At approximately 16:00, Israeli gunboats stationed offshore, northwest of Beit Lahia in the northern Gaza Strip, opened fire at Palestinian fishing boats sailing within 3 nautical miles and chased them. As a result, the fishermen were forced to flee fearing for their lives, but neither casualties nor material damage was reported. At approximately 17:40, Israeli gunboats stationed offshore, northwest of Beit Lahia in the northern Gaza Strip, opened fire at Palestinian fishing boats. The gunboats surrounded a fishing boat belonging to Khamis Salim Taher Abu al-Sadeq (60). The boat was manned by 5 fishermen namely Sayed Nasser Sayed al-Halabi (27), Sami Nabil Salim Abu al-Sadeq (30), Mohammed Ahmed Amin Abu al-Sadeq (25), Ayman Ahmed Khalil Talba (35), and his brother Ehab (16), all from al-Shati’ refugee camp. The boat was sailing within 4 nautical miles offshore. The Israeli soldiers ordered the 5 fishermen to take off their clothes, jump into the water and swim towards the gunboat. The soldiers then arrested the fishermen and confiscated their boat. Note: During the aforementioned day, Israeli forces conducted (6) incursions in the following areas and no arrests were reported: Hebron, Yatta, al-Samou’ and Beit Awla villages in Hebron; ‘Azzoun village, east of Qalqiliyah; and ‘Asalah village, southeast of the city. At approximately 00:00, Israeli forces moved into al-Fundoq village, east of Qalqiliyah. They raided and searched a number of commercial shops and then confiscated DVR devices of the surveillance cameras. At approximately 01:20, the Israeli force withdrew from the village, and no other raids or arrests were reported. At approximately 00:30, Israeli forces moved into Qalqiliyah. They raided and searched 2 houses belonging to Ra’fat Omer Duweiri (22) and Bashar Amin Abdul Rahim Dawoud Ja’idi (24) and then arrested them. At approximately 01:00, Israeli forces moved into Beit Ummer village, north of Hebron and stationed in al-Bayadah neighborhood. They raided and searched a house belonging to Shadi Ibrahim Bahar (27) and then arrested him. At approximately 01:30, Israeli forces moved into Jenin. They raided and searched 2 houses belonging to Mohammed Abdul Ghani Nasif al- Suqi (33), from Abu Theher Mount, west of the city, and Omer Ahmed al-Bulbol (26) in the eastern neighborhood, and then arrested them. Around the same time, Israeli forces moved into Nablus. They raided and searched a number of houses and then arrested Yusuf Suhail Abu Zant (28). At approximately 01:40, Israeli forces moved into Bethlehem and stationed in Ma’ali Valley area in the center of the city. They raided and searched a house belonging to ‘Essa Mohammed al-Haremi (17) and then arrested him. Following that, the Israeli forces moved into al-Karkafah Street. They raided and searched a house of former prisoner Mustafa ‘Essa al-‘Arouj (55) and then arrested him. At approximately 02:00, Israeli forces moved into Nablus. They raided and searched a number of houses and then arrested Husni ‘Emad Husni al-‘Amoudi (28) from his house in Ras al-‘Ein neighborhood, south of the city, and Rashid Zuhair Rashid Labadah (25) from his house in al-Tuffah Valley neighborhood, west of the city. Around the same time, Israeli forces accompanied with 3 military vehicles moved into Yatta, south of Hebron and stationed in Zeif area, north of the city. They raided and searched a house belonging to Jamil Haitham ‘Awad (35) and the arrested him. Around the same time, Israeli forces moved into al-Khader village, south of Bethlehem. They raided and searched a number of houses and then arrested Abdul Rahman ‘Amr ‘Essa (14) and Bilal Omer Abu al-Lahem (14). At approximately 03:40, Israeli forces moved into al-Jalazoun refugee camp, north of Ramallah. They raided and searched a house belonging to Ahmed Zaid Nakhlah (19) and then arrested him. Around the same time, Israeli forces moved into al-Birah and stationed in al-Jenan. They raided and searched a house belonging to Ahmed Emad ‘Awadallah (27) and then arrested him. At approximately 06:50, Israeli gunboats stationed off al-Sudaniyah shore, west of Jabalia in the northern Gaza Strip, heavily opened fire at Palestinian fishing boats sailing within 4 nautical miles and chased them. As a result, the fishermen were forced to flee fearing for their lives, but neither casualties nor material damage was reported. At approximately 19:00, Israeli forces moved into Deir Netham village, northwest of Ramallah. They raided an searched 2 houses belonging to Na’im Abdul Hafith Mathher (15) and Khalid Walid Suleiman (27) and then arrested them. Note: During the aforementioned day, Israeli forces conducted (3) incursions in the following areas and no arrests were reported: Seneriya village, southeast of Qalqiliyah; al-Rasha village, south of the city; and ‘Azzoun village, east of the city. At approximately 01:00, Israeli forces moved into Beit Ummer village, north of Hebron and stationed in al-Boq’ah and al-Jeldah neighborhoods. They raided and searched 2 houses belonging to Jalal Ahmed Abdul Hamid Breghith (39) and Jalal Qasem al-Ra’ei (35). The Israeli forces claimed to search for money belonging to Palestinian factions. The soldiers then arrested Ahmed and Jalal. At approximately 02:00, Israeli forces moved into Seris village, southeast of Nablus. They raided and searched a number of houses and then arrested Sefah Fawzi Qatit (34). At approximately 02:15, Israeli forces moved into Jalqamous village, southeast of Jenin. They raided and searched a number of houses and then arrested Moti’e Jamil al-Haj (22). At approximately 02:30, Israeli forces moved into Barqah village, northwest of Nablus. They raided and searched a number of houses belonging and then arrested Amir Mahmoud Amin Daghlas (23) and Ahmed Eyad ‘Ezz Eden Abu Omer (23). At approximately 06:30, Israeli gunboats stationed off al-Sudaniyah shore, west of Jabalia in the northern Gaza Strip, opened fire at Palestinian fishing boats sailing within 4 nautical miles and chased them. As a result, the fishermen were forced to flee fearing for their lives, but neither casualties nor material damage was reported. Note: During the aforementioned day, Israeli forces conducted (3) incursions in the following areas and no arrests were reported: al-‘Aroub refugee camp, Taffuh and al-Thaheriyah villages in Hebron. At approximately 01:00, Israeli forces moved into Tubas. They raided and searched a house belonging to ‘Obaidah Mohammed Mahmoud ‘Anbusi (23) and then arrested him. Around the same time, Israeli forces moved into Beit Ummer village, north of Hebron. They raided and searched several houses and then arrested Anas Yusuf Sabarneh (20). At approximately 01:20, Israeli forces moved into Nahallin village, west of Bethlehem. They raided and searched a house belonging to ‘ali Khalid Najajrah (14) and then arrested him. At approximately 01:30, Israeli forces moved into Kherbet Kharsa in the northern Valleys, east of Tubas. They raided and searched a house belonging to Wadi’e ‘Ellan Lafi Daraghmah (20) and then arrested him. At approximately 02:00, Israeli forces moved into Halhoul, north of Hebron. They raided and searched a number of houses after which they arrested Mohammed Ibrahim Abu Rayan (35). At approximately 03:00, Israeli forces moved into Yatta, south of Hebron. They raided and searched a number of houses and then arrested Oseid Mohammed al-Haremi (23). At approximately 21:55, Israeli forces stationed along the border fence between the Gaza Strip and Israel, east of Khan Yunis in the southern Gaza Strip, opened fire at dozens of Palestinian young men, who gathered into the east of ‘Abasan al-Kabirah, in protest against the declaration of American President Donald Trump that Jerusalem is the Capital of Israel. The Israeli forces also fired flare bombs in the sky of the area, but no casualties were reported. Note: During the aforementioned day, Israeli forces conducted (4) incursions in the following areas and no arrests were reported: Dura and al-Fawar refugee camp in Hebron; Howrah village, south of Nablus; Beit Fajjar village, south of Bethlehem. At approximately 11:00 on Thursday, 30 November 2017, a group of armed Israeli settlers moved into Ras al-Nakhil area, east of Qasrah village, southeast of Nablus. A settler opened fire at Mahmoud Ahmed Za’al ‘Oudah (48), who was working in his land. As a result, Mohammed sustained a live bullet wound to the right armpit. The bullet penetrated his heart and exited the left armpit. A number of the village residents rushed to the crime scene and attempted to save Mohammed’s life, but he died. Following that, clashes erupted between the settlers and the outraged residents. Thus, an Israeli force moved into the area to protect the settlers and opened fire at the residents. As a result, Fayez Fathi Darwish (47) was hit with shrapnel to the right knee. He was taken to Rafidiya Hospital in Nablus to receive medical treatment.’Ouda’s dead body was evacuated by an ambulance of Palestine Red Crescent Society (PRCS) to one of the City’s hospitals. However, the Israeli forces stationed at Howarah checkpoint at the southern entrance to the city stopped the ambulance. The soldiers called for an Israeli ambulance that came and took the dead body to the Forensic Medicine Institute in Israel for anatomy. At approximately 17:00, a number of settlers protected by the Israeli forces gathered at the entrance to Qasrah eastern village, and provoked the residents. After that, a number of youngsters threw stones and empty bottles at the settlers and soldiers, who immediately opened fire at them. As a result, Amir Mo’tasem Mahmoud ‘Oudah (22) sustained a live bullet wound that settled in the pelvis. Amir was transferred via a PRCS ambulance to Rafidiya Hospital. When the ambulance left the village, the settlers threw stones at it. As a result, the glass of the left window broke down. At approximately 18:30 on Friday, 01 December 2017, the Israeli forces handed ‘Ouda’s dead body to a Palestinian ambulance at the intersection of Jeet village, northeast of Qalqiliyah. ‘Ouda was buried on Saturday, 02 December 2017, in the village cemetery. At approximately 01:00 on Wednesday, 06 December 2017, medical sources at the Gaza European Hospital in Khan Yunis announced the death of Mohammed Saleh ‘Ayesh Abu Haddaf (9) from al-Qararah, northeast of the city, succumbing to wounds he sustained during the 2014 Israeli Offensive on the Gaza Strip. Mohammed’s Family said to PCHR’s fieldworker that on 08 August 2014, Mohammed sustained severe wounds after an Israeli warplane launched a missile at a gathering of civilians in Abu Haddaf neighborhood in al-Qararah village, northeast of Khan Yunis. As a result, 9 civilians, most of them were children, were killed and wounded. Mohammed sustained shrapnel wounds throughout his body and hit with shrapnel to his bone marrow causing penalization to him. He was referred abroad to receive medical treatment and then returned to the Gaza Strip. Each now and then, Mohammed was transferred from a hospital to another. His medical condition was bad since he was wounded until he died on Wednesday. Following the same Friday prayer, dozens of Palestinians from Kherbet Qalqas, east of Hebron organized a protest at the southern entrance to the village, which has been closed by the Israeli forces for 17 years, restricting the movement of the village residents. Large force of Israeli soldiers arrived at the area. When civilians attempted to move towards the sand barriers which close the road while raising the Palestinian flags and banners, the Israeli soldiers threatened to fire tear gas canisters at them if they did not leave the area that was announced as a closed military zone. Moreover, the Israeli forces detained press crews and prevented them from covering the incident until the end of the protest. However, no other incidents were reported. At approximately 13:30 on Friday, 01 December 2017, dozens of Palestinian youngsters made their way to the border fence between the Gaza Strip and Israel, east of al-Shuhada’a Cemetery, east of Jabalia in the northern Gaza Strip, in protest against the Israeli closure imposed on the Gaza Strip. The youngsters approached the security fence and threw stones at the Israeli soldiers stationed along the border fence. The soldiers fired live bullets, rubber-coated metal bullets, and tear gas canisters at the protestors. As a result, a 16-year-old child from al-Sheja’eya neighborhood was hit with a live bullet that entered and exited the right foot. He was transferred by a PRCS ambulance to the Indonesian Hospital. His injury was classified as moderate. As part of the collective punishment policy applied by the Israeli forces against the Palestinian families of those accused of carrying out attacks against the Israeli forces and/or settlers, early on Friday, 01 December 2017, Israeli forces demolished a house belonging to Mohammed Zeyad Abu al- Rab in Qabatyah, southeast of Jenin. According to PCHR’s investigations, at approximately 01:30 on Friday, Israeli forces accompanied with several military vehicles and 3 bulldozers moved into Qabatyah village, southeast of Jenin, and stationed in the vicinity of a house belonging to prisoner Mohammed Zeyad abu al-Rab, who carried out a stab attack in Kafer Qasem village in Israel on 04 October 2017. The bulldozers demolished the one-story house established on an area of 140 square meters. The house sheltered 5 individuals, including 3 children. During the demolition, a number of youngsters gathered around the house and threw stones and empty bottles at the Israeli soldiers. The soldiers fired tear gas canisters and rubber-coated metal bullets at them. As a result, a 25-year-old civilain sustained a metal bullet wound to the back and was transferred to Dr. Khalil Suleiman Hospital in Jenin for medical treatment. The Israeli forces also arrested Saleh Amjad Lubani (22) and Qusai Mohammed Kamil (20) and took them to Salem military camp, west of the city. At approximately 07:00 on the same day, the arrestees were released in front of the abovementioned camp. On Wednesday, 29 November 2017, the Israeli authorities allowed 1 person; on Thursday, 30 November 2017, 12 persons; and on Monday, 04 December 2017, one person to return to the West Bank. On Tuesday, 05 December 2017, the Israeli authorities allowed 3 persons, who work at the General Authority of Civil Affairs (GACA), and internationals to renew their permits. On Thursday, 30 November 2017, the Israeli authorities allowed a person to testify before the Israeli courts. Ramallah: Israeli forces established (12) checkpoints all over the city. At approximately 08:30 on Wednesday, 29 November 2017, the Israeli forces established 2 checkpoints at the entrance to al-Nabi Saleh village, northwest of Ramallah and on the bridge of ‘Atarah village, north of the city. On Thursday, 30 November 2017, Israeli forces established 3 checkpoints at the entrances to Kufor Ne’amah and Beit ‘Ur al-Foqah villages, west of Ramallah; and on ‘Atara village bridge, north of the city. On Sunday, 03 December 2017, 4 similar checkpoints were established at the entrance to al-Nabi Saleh village, northwest of Ramallah; at the entrance to Senjil village, at the entrance to ‘Ain Sinah village, north of the city; and at the entrance to Deir Jareer village, northeast of the city. Hebron: Israeli forces established (14) checkpoints all over the city. On Wednesday, 29 November 2017, Israeli forces established 2 checkpoints at the northern entrance to Hebron and at the entrance to al-Koum village. On Thursday, 30 November 2017, 3 similar checkpoints were established at the southern entrance to Halhoul village, at the entrance to Taramah village, and on Western Beit ‘Awaa village Road. On Saturday, 02 December 2017, Israeli forces established a checkpoint at the northern entrance to Halhoul village. On Sunday, 03 December 2017, 2 similar checkpoints were established at the entrance to Halhoul village and at the entrance to al-‘Aroub refugee camp. On Monday, 04 December 2017, Israeli forces established 2 checkpoints at the entrances to Northern Yata and ‘Oyoun Abu Seif Road. On Tuesday, 05 December 2017, 3 similar checkpoints were established at the entrances to villages of Raboud, al-Samou’a and Ethna. On Wednesday, 06 December 2017, Israeli forces established 3 checkpoints at the entrance to Taramah village and southern and northern entrances to Hebron. Qalqiliya: Israeli forces established (15) checkpoints all over the city. On Thursday, 30 November 2017, Israeli forces established 3 checkpoints at the eastern entrance to Qalqiliyia, at the entrances to ‘Azoun village, east of the city, and Jayous village. On Friday, 01 December 2017, Israeli forces established 3 checkpoints at the entrance to Jeet village, northeast of Qalqilya, and the entrance to ‘Azoun village, east of the city (the checkpoint was established twice). On Saturday, 02 December 2017, 3 similar checkpoints were established at the eastern entrance to Qalqiliya between the villages of Jayous and Kafr Jamal, northeast of the city and between the villages of ‘Azoun and ‘Ezbet al-Tabib, east of the city. On Sunday, 03 December 2017, Israeli forces established 5 checkpoints at the eastern entrance to Qalqiliya; entrance to ‘Azoun village, east of the city (the checkpoint was established twice); between the villages of Jayous and ‘Azoun, northeast of the city; the entrance to Heblah village tunnel; and at the southern entrance to the city. At approximately 16:50 on Monday, 04 December 2017, a similar checkpoint was established between the villages of ‘Azoun and ‘Asalah, east of the city. At approximately 11:55 on Thursday, 30 November 2017, Israeli forces tightened it measures at ‘Inab checkpoint, east of Tulkarm and restricted Palestinian civilians’ movement until 13:30. At approximately 20:20 on the same day, Israeli forces established a checkpoint at the entrance to Beit Lid village, east of the city. At approximately 10:10 and 19:50 on Sunday, 03 December 2017, the Israeli forces recurred their arbitrary measures at ‘Inab checkpoint and obstructed the Palestinian civilians’ movement. At approximately 09:00 on Saturday, 02 December 2017, Israeli forces established a checkpoint at the entrance to Deir Abu Da’ief village, northwest of Jenin. At approximately 12:00 on Sunday, 03 December 2017, when Muhanned Mohammed ‘Alian ‘Awad (18) was grazing his sheep in al-Faw area in ‘Ein al-Helweh, where he lives, near “Maskiot” settlement in the Northern Jordan Valley, the settlement’s guard namely Rami saw him. The guard called the Israeli forces, who arrived in a military jeep and arrested ‘Awad leaving his sheep behind. The Israeli soldiers took him to al-Hamra Checkpoint in the Central Jordan Valley, east of Nablus, and detained him for 6 hours before releasing him at the checkpoint. At approximately 22:40 on Monday, 04 December 2017, Israeli forces established a checkpoint at the main entrance to al-Jalazone refugee camp, north of Ramallah. The Israeli forces searched Palestinian civilian vehicles and checked the passengers’ ID Cards. The Israeli soldiers arrested Ahmed Mahmoud Demrah (25), from al-Nobani Farms Village, northwest of the city, when he was on his way to visit a friend in the above-mentioned Camp. The Israeli soldiers removed the checkpoint and took Demrah with them. At approximately 08:00 on Tuesday, 05 December 2017, Israeli forces arrested Ahmed Yousif al-Haroub (22) from Deir Samit village, southwest of Dura, southwest of Hebron, at a checkpoint in the vicinity of Ramallah and was taken to an unknown destination. At approximately 00:30 on Wednesday, 29 November 2017, Israeli forces moved into ‘Ein al-Lozah neighborhood in Silwan village, south of East Jerusalem’s Old City. They raided and searched a number of houses, from which they arrested ‘Alaa’ Tawfiq Abu Tayeh (19) and Tariq Sa’adah ‘Abbasi (26). Israeli forces later withdrew taking him to an unknown destination. At approximately 02:00, Israeli forces moved into al-Tour Mount, east of occupied Jerusalem. They raided and searched a house belonging to the family of Khalil Ayman Abu al-Hawa (15). Israeli forces arrested the aforementioned child and later withdrew taking him to an unknown destination. At approximately 04:30, Israeli forces moved into al-Issawiyah village, northeast of occupied Jerusalem. They raided and searched a house belonging to the family of ‘Ali Mohammed Muheisen (19). They arrested the abovementioned civilian and later withdrew taking him to an unknown destination. At approximately 14:00, Israeli forces arrested Qosay Wasim Abu Romouz (14) from Ras al-‘Amoud neighborhood when he was on his way back from his school in al-Tour Mount, east of occupied Jerusalem. At approximately 15:00, Israeli forces arrested Ahmed Mohammed Mahmoud (14) when he was on the main street in Ras al-‘Amoud neighborhood, east of occupied Jerusalem. At approximately 01:00 on Sunday, 03 December 2017, Israeli forces moved into Silwan village, south of occupied East Jerusalem’s Old City. They raided and searched a house belonging to Zain Mahran Showiki (08) and arrested him. Zain was then taken to Salah al-Deen Police Station. At approximately 01:30, Israeli forces moved into Abu Dis village, east of occupied Jerusalem. They raided Al-Quds University Student Dormitory, from which they arrested Mohamed Raied Misk (21), from Hebron. At approximately 22:30 on Sunday, Israeli forces moved into Bir Ayoub neighborhood in Silwan, south of occupied East Jerusalem’s Old City. They raided and searched a house belonging to the family of ‘Ali Hijazi Da’nah (16). They then arrested Da’nah and later withdrew taking him to an unknown destination. At approximately 00:30 on Monday, 04 December 2017, Israeli forces moved into al-Tour Mount, east of occupied East Jerusalem. They raided and searched a house belonging to Khalid Wael Abu Sbitan (14). They then arrested Sbitan and later withdrew taking him to an unknown destination. At approximately 03:00, Israeli forces moved into Kafur ‘Aqab village, north of occupied East Jerusalem. They raided and searched a house belonging to the General Director of the Legal Department in the Prisoners and Ex-Prisoners Affairs Ministry, Iyad Misk (37), and arrested him. The Ministry clarified in a statement that the Israeli forces took Iyad to “Petach Tikva” investigation center without identifying the arrest reasons. At approximately 09:00 on Monday, Israeli forces arrested 4 guards of al-Aqsa Mosque in occupied East Jerusalem’s Old City and took them to the detention and interrogation facilities in the village when the guards were near al-Qataneen Gate and then taken to detention centers in the village. The arrested persons were identified as Loai Abu al-Sa’d, Fadi Mohamed Abu Mizer, Qasem Kamal, and Ahmed Abu ‘Alyia. The media coordinator of the Islamic Endowment (Awqaf) Department, Firas al-Debes, said that the four guards in the previous day participated in confronting the settlers who headed to the Dome of the Rock Mosque yard accompanied with a number of Israeli senior officers; adding this was unprecedented and warns- according to the Jerusalem institutes- of more escalations against the Al-Aqsa Mosque. Later, the Israeli forces released the guards: Ahmed Abu Alia, Qassem Kamal and Fadi Abu Mizer after they were threatened not to approach the settlers groups who storm al-Aqsa Mosque, while Loai Abu al-Sa’d is so far under arrest. At approximately 00:30 on Tuesday, 05 December 2017, Israeli forces moved into Badou village, northwest of East Jerusalem. They raided and searched a house belonging to the family of former prisoner Ahmed Ibrahim Zahran (34). They arrested him and later withdrew taking him to an unknown destination. At approximately 02:00, Israeli forces moved into Ras al-‘Amoud neighborhood, east of occupied East Jerusalem’s Old City. They raided and searched a number of houses, from which 3 children were arrested. Israeli forces later withdrew taking the the 3 children with them. The arrested children were idneitifed as Khaled Fawaz Abu Qalbein (14); Mohammed Hani al-Haymouni (12) and ‘Abdullah Ramez al-‘Abbasi (13).At approximately 00:00 on Wednesday, 06 December 2017, Israeli forces moved into al-Tour Mount, east of occupied Jerusalem. They raided and searched a number of houses, from which they arrested Mohammed Yasin Abu al-Hawa (14) and Nader Abu Laban (19). At approximately 03:30, Israeli forces moved into Beit Hanina village, north of occupied Jerusalem. They raided and searched a house belonging to Secretary of Fatah movement in Jerusalem, Shadi al-Mattour. They arrested the abovmentioned civilian and later withdrew taking him to an unknown destination. Mofid al-Haji, Lawyer at Palestinian Prisoner Club, said that the Israeli court accused Mattour of planning for an uprising “Intifada” in light of the American President’s Declaration of moving the American Embassy to Jerusalem. At approximately 11:00 on Tuesday, 05 December 2017, the Israeli Municipality using its heavy vehicles leveled Foundations of a building and a parking in Ras Shehadah area in Sho’afat refugee camp, north of occupied Jerusalem, without prior warning under the pretext of building without a license. Eyewitnesses said that a large force of Israeli soldiers along with bulldozers moved into Sho’afat refugee camp from the military checkpoint side. The Israeli forces deployed on the main street, surrounded many buildings and topped their roofs. 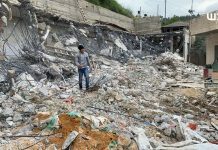 The Israeli forces then started leveling a parking in the vicinity of 3 buildings and foundations of an under-construction building, where a car garage belonging to Engineer Issam Mohammed ‘Ali was to be established. Moroever, the building was supposed to shelter 50 persons. The residents of Ras Shehadah area said that the Israeli forces intend to demolish 3 under-construction buildings in the abovementioned neighborhood near the annexation wall. At approximately 09:00 on Wednesday, 06 December 2017, Israeli Municipality crews along with the Israeli police moved into neighborhoods of Beir Ayoub, Wadi al-Helweh and al-‘Abasiyah in Silwan village, south of occupied Jerusalem’s Old City, and fixed demolition orders to a number of residential facilities. According to the residents of Silwan village, the Israeli forces moved into several neighborhoods in the village and distributed the demolition orders. In Wadi al-Helweh, the Israeli municipality gave Wadi al-Hilweh Information Center 48 hours to remove its iron gate and threatened to cut it off if they do not remove it themselves. The Israeli municipality also gave an order to one of the neighborhood residents to remove agricultural buckets in front of his house. In Beit Ayoub neighborhood, the Israeli municipality crews fixed an order for the Siyam family to demolish a room built of wooden plates. Moreover, the Nature Authority crews along with the Israeli police stormed a land belonging to Khaled al-Zir in al-‘Abasiyah neighborhood, surveyed it and took photos of it. At approximately 18:00 on Thursday, 30 November 2017, Israeli settlers attacked a Palestinian woman and her daughter who were both walking in al-Sharaf neighborhood in East Jerusalem’s Old City. As a result, the mother and her daughter sustained various bruises. Asmaa’ Shyoukhi (53) said that settlers beat up her and her daughter Raghad (17) using belts and a metal pole in addition to shouting insults at them. She said that she was walking in al-Sharaf neighborhood heading to her house in Silwan village with her daughter when she was surprised with 15 setters between 14 and 16 years old stopping her and shouting insults. They then threw stones at the mother and daughter and beat them up with belts. One of the settlers also ran over her with a bike, causing her to fall on the ground. Another settler then attacked the mother and her daughter with a metal pole and threw garbage on them. Asmaa’ said: “there was a group of settlers and internationals in the area, and then one of the internationals called the police that arrived in the area. The police arrested me and my daughter while all the settlers managed to flee away. During our detention in al-Qashlah police station in Jerusalem’s Old City on grounds of attacking settlers, I asked the interrogator to check the surveillance cameras in the scene, and indeed he did so and found that we who were attacked. Thus, we filed a complaint against the attackers.” Shyoukhi family took the mother and her daughter to the hospital, where doctors said they sustain bruises. A barrack built of tin plates on an area of 200 square meters and used for grazing sheep. The barrack belongs to Ashraf Mohammed al-Batran (50). At approximately 14:00 on Thursday, 30 November 2017, a group of settlers from the “Price Tag” groups in “Yitsahar” settlement under the Israeli forces’ protection attacked the south-eastern outskirts of ‘Asirah al-Qabaliyah village, south of Nablus. The settlers attempted to attack the Palestinian houses in the area, but families gathered to throw stones at them to distance them. The Israeli forces immediately protected setters by standing in front of them and then intensively fired tear gas canisters at the Palestinian families. As a result, dozens of civilians suffer tear gas inhalation. At approximately 10:00 on Monday, 04 December 2017, dozens of settlers gathered at the eastern entrance to Qasrah village, southeast of Nablus, upon calls from the Israeli settlement organizations to gather in a cave in Ras al-Nakhil Mountain. It should be mentioned that on 30 November 2017, Palestinian civilians detained a number of settlers in the cave after it was declared that settlers killed Mohammed ‘Odah. At approximately 10:50, around 13 Israeli military jeeps carrying soldiers and police officers arrived in the area to provide protection for settlers. Dozens of families from the village gathered around 700 meters away from the Israeli soldiers and settler’s whereabouts to prevent them from reaching the cave. At approximately 11:00, a number of Israeli soldiers stepped out of their jeeps and moved along with 3 jeeps towards the Palestinian civilians’ gathering. At approximately 11:10, Israeli soldiers heavily fired tear gas canisters and opened fire at the Palestinian civilians. As a result, Ahmed Fayez Darwish Hasan (22) was hit with a bullet, which entered his back and settled in the left side of his chest. The Israeli soldiers detained the wounded person for a while before allowing a Palestinian ambulance to transfer him to Rafidia Surgical Hospital in Nablus. He was immediately admitted to the OR, and his condition was described as serious. Moreover, a 20-year-old civilian sustained bullet shrapnel wounds while ‘Allan Sayel Hasan (25) was arrested and taken to an unknown destination.